Sorry it has taken me so long to get back with you. I absolutely LOVED Echo City. Once I started reading I couldn’t put it down. I recomend your books to any and all that I can. Can’t wait to buy some of your other works. Looking for the Hidden Cities now. Please keep writing and I promise you will always have a fan! Thanks David! Please spread the word. And I do indeed plan to keep writing…. I have read one of your books and I intend to read many more your work has really inspired me I think writing is great, will you be publishing any more books? Really enjoying Echo City with about 100 pages left to go. Any plans to publish prequels or sequels? Would love to see this concept expanded. Just wanted to drop by and tell you I loved Echo City. I just finished it last night, and I thought it was excellent the whole way through. Just finished Echo City the first book of yours that I’ve read. Thouroughly enjoyed it, indeed the best thing I’ve read in a while. One thing that struck me as I was reading it was how two authors can take some common themes ( ancient city, gene splicing, lots of different races ) and come up with two totally different books ie China Mieville had Perdido Street Station and you’ve got Echo City. Both great and both….. completely different. Any chance we might get some stories from Echo City’s past one day ? I started reading Echo City last night. I finished it this morning. Absolutely captivating, from beginning to end. An engaging and compelling piece of writing. Thank you. Ben, plenty more books on the way – keep an eye on this website. Sam – no real sequel plans yet, but the next fantasy novel due next year is, I think, equally fascinating. More on that soon. Anninyn – thank you so much. Clive, thank you, too. There’s an Echo City story in the anthology Swords & Dark Magic. Michael … that’s high praise, thanks. I’m so glad you’re all enjoying ECHO CITY …. hope you like what’s coming next, too. I loved reading this. The concept is just amazing. But in my opinion you shouldn’t make a sequel. The story of Echo City i believe doesn’t need to be continued into another book. I think though that we should instead just dream of what could be next. This book and another called “Souls in The Great Machine” inspire me to write stories (my English teacher is convinced that i’ll succeed). Having simply selected Echo City on a whim from a book shop, I can honestly say even with 150 pages to go, it is the most fascinating and thought provoking book I have ever read. I cannot wait to read more of your novels and thank you for writing this amazing story. I first discovered your books on a rainy day, when I was loosely browsing through my local library, having run there to shelter from the storm. Echo City looked pretty intriuing, so I simply plucked it from the shelf and scurried off home. But from the moment I opened up the novel, it drew me in and I’ve been hooked on your books ever since. 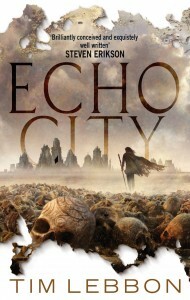 Have just finished Echo City, Loved it!!! was the first of your books I’ve read and will deffinetly be reading more, but was wondering if a follow up would be coming? Thanks Dale, that’s good to hear! No plans for a sequel yet. But you might like THE HERETIC LAND too, Similarly dark and twisted. This was my the first book I read of yours. Great imagery and characters and really really interesting concepts. Loved reading it despite not understanding parts of it. Be great to see this made into a TV/movie. Thanks Sanno! I’d like that too … maybe one day. Got a bit of a problem with Echo City – every time I finish reading it I find myself having to read and re-read it! A really good story, with characters I care about (except for Jan Ray!). Looking forward to catching up with more of your stuff. Thank, Clare! There’s plenty more out there.